DISCOUNTS FROM SATURDAY MAY 25TH THROUGH SATURDAY JUNE 8TH AND FROM SUNDAY JUNE 16TH THROUGH SATURDAY JUNE 22ND, 2019!! BOOK NOW FOR EXCEPTIONAL VALUES!! I HAVE A 2 BEDROOM UNIT I GIVE A DISCOUNT FOR SMALLER GROUPS DURING NON-PEAK RENTALS SO IF MY 1 BR IS ALREADY BOOKED INQUIRE ABOUT MY OTHER UNIT!!! I ONLY MANAGE TWO UNITS IN THE COMPLEX AND MY WEEKLY RENTALS ARE SUNDAY TO SUNDAY DURING PEAK SUMMER MONTHS. PLEASE CHECK MY WEBSITE CALENDAR FOR AVAILABILITY OR EMAIL ME OR CALL ME CONCERNING RATES AND AVAILABILITY. . Please also consider our 2 BR TOP FLOOR CORNER LAKE FACING unit also available at this complex(VRBO #3469300HA)!! 1 BR rates possible for the 2 BR unit(slightly more $$ b/c of view) for a couple seeking last minute getaway when the 1 BR unit is rented out DURING LOW SEASON(OCTOBER THROUGH APRIL)!! The Asher Premier Beachfront Condo is my redecorated(new furniture, ceiling fans & repainted) one bedroom modern, 600+ sq. ft. CORNER unit on Lake Michigan. This LAKE FACING garden level unit is fully furnished and sleeps four adults with a king-size bed and a queen sized leather couch sofa. The unit is both poolside and beachside and it features unbeatable sunsets views while sitting anywhere within the unit. The heated private pool is just steps away from your bed and the private beach where you can walk for miles. The complex is next to a Packard City Park and just a short walk from the quaint downtown of South Haven where there are plenty of shops and great little restaurants. This historical town (founded in 1833) has two light houses guiding pleasure boats to the multiple marinas scattered along the Black river which runs through this idyllic town. It takes only 20 minutes to drive from South Haven to Saugatuck, 30 minutes to Holland, two plus hours to Chicago and three hours to Detroit. South Haven, not just a summertime destination!! Also, please see our Asher Premier Beachfront 2 BR unit with even better views in this same complex @ VRBO #3469300 and also consider my Golf property(4 miles from Gulf of Mexico) in Naples, Florida, VRBO # 378357. I had the great fortune of being born and raised in South Haven in 1956. As a kid, I thought this small town was too slow for my likes especially during the long, snowy winters. As I matured, I realized how lucky I was to have experienced the lifestyle of this community. I remember participating in the clubs and sports the community had to offer, enjoying the Blueberry Festival and Fourth of July events. Some of my favorite activities were water skiing or fishing in Lake Michigan and snow skiing at nearby Timber Ridge. We have cooked blueberry pancakes for breakfast on the beach during the summer and climbed the ice bergs in the winter. I have brought my wife and kids back for the past twenty five plus years. My kids have experienced the joys of the town throughout their life and I know they will continue the traditions with their children. I hope that you can feel a small piece of what joys this town has given to me during your week vacationing in South Haven. I was born and raised in South Haven. We have admired this property in particular over the years when we took our kids to the public beach at Packard Park. My wife always said “that is the place we should find a unit in”. It has so much to offer with it’s own private beach and pool. The terrace is huge and is great for entertaining or eating your dinner while watching the sunset. This dream continued for many, many years until we purchased it in 2005. We love our unit since it faces the lake and is so comfortable to sit and read. We love sleeping with the window open and hearing the waves crash on the shore. It is great just walking out the door onto the beach for a stroll to the North Pier. The location of the unit and the size of the town allows you to walk into town for shopping or meals. Go try the onion rings of Clementine’s or the bucket of perch at the Thirsty Perch in town. You must go to Captain Nemos for ice cream and don’t forget about the Golden Brown Bakery. Once here I am sure you will agree that it’s great having a pool and being on the lake at the same time and that you will want to return year after year to realize life’s simple pleasures!!! 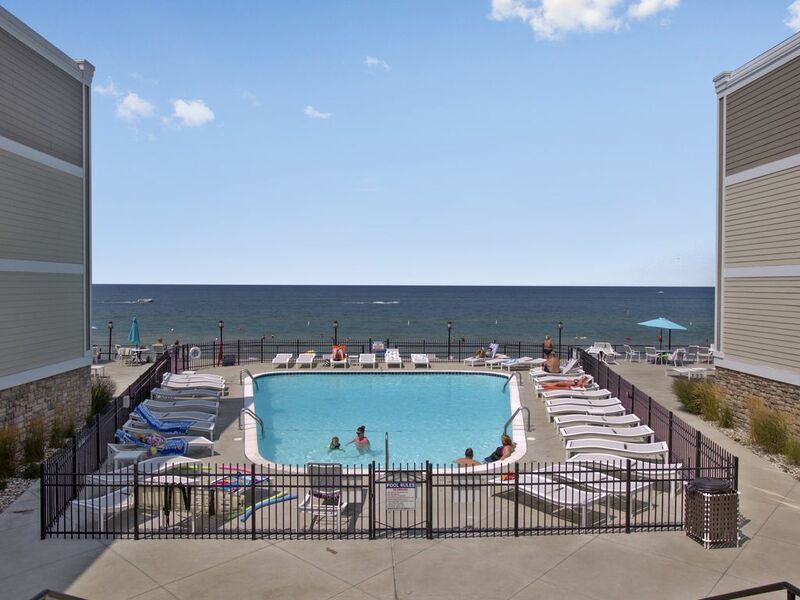 Unit has outstanding Lake Michigan views and is located steps away from your private pool and private beach!! The unit is within walking distance of the small, quaint town of South Haven and the Black River running through the town!! Lake view from both living room and the bedroom. Wide private beach just steps away from the pool, large terrace and your bedroom. See the Unsalted Lake Michigan and great sunsets from the living room and bedroom!! One wall unit in living room and three new ceiling fans!! Coin operated unit down the hall on same level. Coin operated unit down the hall on the same level. Private parking lot with assigned spot during the peak summer months. The unit was recently fully redecorated including a new living room set. The leather sofa bed is perfect for seeing the lake and sun sets or watching the flat screen TV! Gas stove & oven allows perfect control for cooking!! BUT why cook when you are on vacation!! Modern stainless steel appliances and granite countertops!! The unit was recently fully redecorated including a new dining room set. Flat screen TV in living room & in bedroom! There is no elevator available in this complex. Access to the condo from parking lot side requires 25 stairs. Access from the condo to the pool requires 10 stairs. Fantastic when the Lake temperatures are cooled off after a storm! Open Memorial Day weekend and into early September(weather dependent). Great location and wonderful views! Great location and well kept property. Walking distance to South Haven. Dear John, thank you so much for the nice review!! Thanks for traveling alm the way from Iowa to stay with us!! We hope to see back again soon!!! Great for our week in S. Haven - steps away from the beach, the pool, and nearby anything you would need to get to. Kitchen had almost everything we needed to prepare our own food for the week. Highly recommend! Hi Jessica, thank you again for staying with us but also for writing such a nice review!! We look forward to your return!!! Great condo with amazing views. Loved the private beach and pool... So conveniently located too. Dear Lindsey, thank you so much for staying with us and so happy you loved our Condo and the Complex. I agree we love being able to walk into town if desired for shopping and meals!! We would love to have you again soon!!! Beachfront wasn’t crowded, pool was warm, decks and chairs plentiful well maintained. Condo was larger than expected and had good lake views. The king bed was comfortable and generally the furnishings worked well. Note the one bathroom is en suite and is small. Noodles, beach chairs for toddlers and adults, and adult sling chairs are provided. Condo was clean and on site representatives were helpful. HI Sheryl, thank you so much for the nice review. It's great having a private beach and pool to limit the number of people onsite We are so glad you are trying our two bedroom unit with fantastic coastline views next summer!! A blissful break from routine with beautiful pool and beach. Well appointed condo and greeted with wine, banana bread and coffee! Beautiful views, spectacular sunsets. We will be back! Dear Colleen and Tom, thank you again for allowing us to serve your vacation needs in South Haven. We are so happy that you enjoyed your stay and thanks for the nice review!! We hope you will pass on our names to your many friends!! Great off the beach location, included parking, all amenities present. Dear Lendell, we were so happy that you loved our Condo and that you selected our Condo to help celebrate your 30th Anniversary!! We were glad you loved our special gifts to you and your Bride! Fall Color Drives, Wine Country Tours, Berry Picking in Season, Art Festivals, Dune Buggy Rides, Tall Ship Tours/Rides, Canoeing, Cross Country/Downhill skiing, Ice skating, Annual Events in South Haven, Harbor Festival, Riverfront Concerts, Arts/Craft Shows, Vintage Boat Show, Garden Walk, Antique Car Show, Fourth of July Celebration, National Blueberry Festival, Winter Fest. South Haven is simply AWESOME. Our beaches are the best AND, one can easily walk from either North or South Beach right into town for lunch and shopping. We have a beautiful lighthouse with zero industry coming up our river, we're the sweetest little picturesque gem in Southwest Michigan! I Hope you experience the natural beauty and lovely shops and restaurants we proudly offer our visitors! Here is what the visitor's bureau has to say: Please visit their site for more information! Welcome to South Haven - It's a feeling! One that's hard to put into words, but once you visit you'll feel it too. It's an experience you'll never forget. It's what keeps you coming back for more. From the moment you arrive until the time you have to leave, you will know you are some place special. This one-of-a-kind Michigan Beachtown cannot be fully appreciated by reading about it in a brochure, cannot be touched even through the most technologically advanced website, and all the beautiful sunset photos in the world cannot do it justice. But don't take our word for it; come here and see for yourself or trust glowing reviews from publications like: The New York Times, Midwest Living, Michigan Travel Ideas, Chicago Sun Times, Chicago Tribune, Detroit Free Press, Underwater Journal, SkyWest Magazine, Western Parent Magazine, Art Showcase Magazine, and many more! -Weekly rentals during the Peak Summer Season run SUNDAY TO SUNDAY. - Rates are based on two renters and there is an additional fee for added renters. - Please review Rental Agreement and Association Rules. A Association Contract Form will need to be filled out. -Additional Cleaning & Laundry fees of $120 should be reflected in quote. -The initial deposit of 50% is required to book Peak season weekly reservation and remaining amount is due 35 days before check-in. - Standard rate illustrates the nightly fee during low season(Oct thru April) and maynot reflect the cleaning and laundry charge, operation fee or fully refundable damage deposit. It is best to ask for a detailed quote. -90 day cancellation cutoff for deposit refund if owner can find a new renter for same number of nights and at the same rate. If cancelled less than 90 days the renter is obligated for the whole rental fee less damage deposit and cleaning fee.